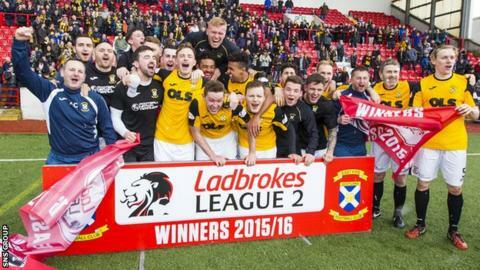 East Fife were confirmed as Scottish League Two champions after a stalemate at second-placed Clyde. A draw was enough for Gary Naysmith's side with rivals Annan and Queen's Park dropping points. Clyde survived a goalmouth scramble before a shot from the hosts' Jordan Kirkpatrick went narrowly wide. Steven Campbell went close for East Fife with a strike that just cleared the crossbar but the visitors did not need to score to seal promotion. Match ends, Clyde 0, East Fife 0. Second Half ends, Clyde 0, East Fife 0. Mark McLaughlin (Clyde) wins a free kick in the attacking half. Foul by Jamie Insall (East Fife). Attempt missed. Chris Smith (Clyde) left footed shot from outside the box is too high. Corner, East Fife. Conceded by Mark McLaughlin. David Marsh (Clyde) is shown the yellow card for a bad foul. Substitution, Clyde. John Gemmell replaces Ross Millen. Kevin Smith (East Fife) is shown the yellow card for a bad foul. David Marsh (Clyde) wins a free kick on the left wing. Jason Kerr (East Fife) wins a free kick on the left wing. Sean Higgins (Clyde) wins a free kick in the defensive half. Substitution, East Fife. Jamie Insall replaces Ross Brown. Substitution, Clyde. Paul Slane replaces Jordan Kirkpatrick. (East Fife) wins a free kick in the attacking half. Jordan Austin (East Fife) wins a free kick on the left wing. Attempt missed. Patrick Slattery (East Fife) right footed shot from the centre of the box is close, but misses to the right. Corner, Clyde. Conceded by Gary Naysmith. Hand ball by Jonathan Page (East Fife). Attempt missed. Sean Higgins (Clyde) right footed shot from the centre of the box is close, but misses to the right. Mark McLaughlin (Clyde) is shown the yellow card for a bad foul. Foul by Mark McLaughlin (Clyde). Jamie Watson (Clyde) wins a free kick in the defensive half. Foul by Jordan Kirkpatrick (Clyde).